It was dark when I awoke. Dark and hot, where was I? Slowly the smell of decaying aquatic vegetation made its way to my nose, I was still on the river. It was just after five a.m, the temperature must of dropped in the night as I’d closed the clam shell to my bivy and pulled my sleeping bag on. It was so quiet. I made a bowl of instant porridge and went to sit by the river side. A bull moose was sprinting along the banks , I’m amazed at how quiet an animal that large can be when it wants to. I looked around, the sun was now pouring over the river, two other moose were busy having breakfast around Grassy lake. I had already seen more moose in under twenty four hours than I had in the last two years. 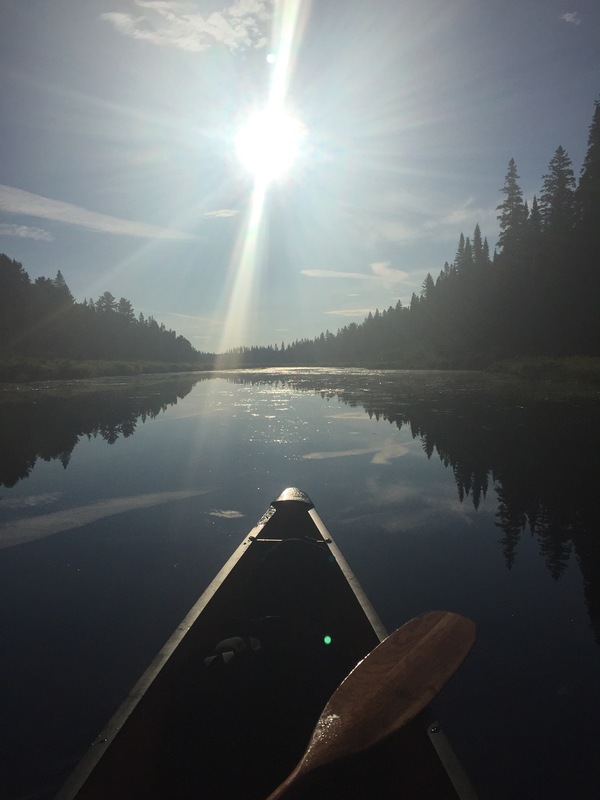 I broke camp , which is small and takes just a few minutes, packed my canoe and headed of down the river. 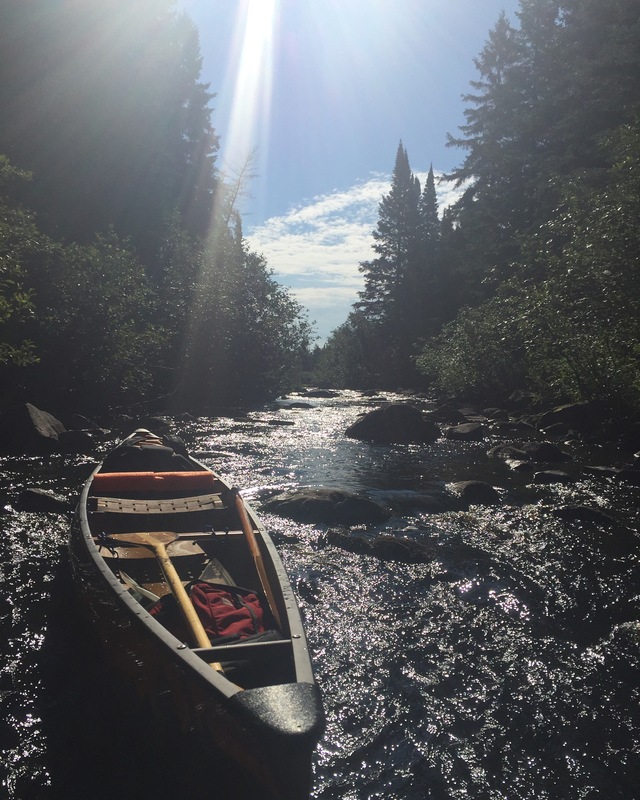 The time spent on the Nipissing on day two has got to be some of the most fun I’ve had paddling in a while. The river was still low, but it had widened and deepened allowing much easier travel than the day before. I quickly made my way past Loon tail creek and down to my first portage. I had camped here three falls prior with a friend. You could barely see the campsite with the long grass and the grown in fire pit. I’m surprised more people don’t travel down here. Seven portages and a big stretch of the Nip is what I’d be traveling today. My destination was a site in Browse Creek Junction just before a two kilometre portage. The Nipissing’s scenery is constantly changing. One minute you’re surrounded by alders, the next cruising beside giant white pines on the forest edge. My favourite though is the grassy sandy banks with just a few alders mixed in where muskrats and otters scurry along the banks. I’m transported back to my childhood and to one of my favourite books then, The wind in the willows. Each time I turn a corner I fully expect to see Mr.Toad or Mole paddling their small boat. My imagination has run wild this trip and I guess it’s a side effect of being solo and not seeing a single soul. I stopped for lunch on a large dead pine that was blocking the river. Though the river was wider and deeper there were still many dead falls and beaver dams to contend with but they allowed me to stretch my legs so I wasn’t complaining. Walking the Portage past the Highview Rangers cabin definitely slowed me down. No it wasn’t terrain or bugs that did it. It was the sheer amount of wild blueberries along the side of the portage. Wow there were thousands! I couldn’t walk more than a few steps before my eyes would be drawn to the deep blue colour taunting me from the bushes. If I was a bear I would definitely live near this portage. Large open fields on one side a cool refreshing River on the other and enough blueberries and raspberries to last me all summer. Sure enough there was quite a bit of bear sign along the trail and try as I might to catch a glimpse, no animals were about as I made my way back and forth on the portage. Back on the river I started to notice remnants of bridges, logs with nails ect and realized I was nearing my destination for the evening. The site is gorgeous nestled along the side of the river on a portage beside one of the biggest white pines I’ve ever seen. I set camp, made dinner, and then tried my luck fishing. An hour later and dozen or so brook trout later I was ready to crawl into my bivy and drift off. Tomorrow would be my last day on the Nip before hitting the lakes and I was excited to see what it had in store for me.